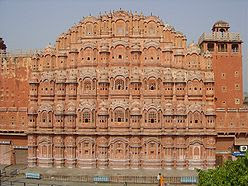 Art-C: Hawa Mahal....an intricate jewel in Indian architecture!!! Hawa Mahal....an intricate jewel in Indian architecture!!! Most of us, me included might never have heard of 'Hawa Mahal', a beautiful & delicate architectural wonder situated in Jaipur, India. I came across it while searching for some other information & the detailing of the building just caught my eye!!! Also called as the 'Wind Palace', because of its numerous windows which allows wind (hawa) to pass through, it was constructed under the reign of Maharajah Sawai Pratap Singh & designed by Lal Chand Ustad in 1799. A symbol of fanciful architecture, it was in the form of the Hindu God, Lord Krishna’s crown or mukuta. The beauty of the palace, shines through even in photographs & the vision of its ruler is embodied in this architectural marvel that reflects a profound contradiction, that of being delicate yet strong enough to stand the test of time!! !